Every so often, I need some comedy in my life. 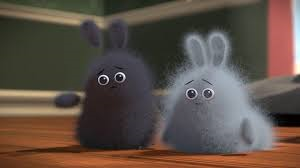 I will freely admit that short horror films are a favorite, but sometimes, I need something equal parts cute, fluffy and funny. So here we are, in the midst of a heat wave, and I need that warm, fuzzy feeling. Today, I’m going for the Beth Tomashek and Sam Wade’s Dust Buddies. Click here for Dust Buddies. They’re bunnies! In DUST FORM!!! Yes, I really am that simple sometimes. I can’t help it. A cute little floof that communicates through squeaks? Check. Winsome accordion soundtrack? Double check (and well-done). A well-timed fist bump between two friends? Oh yeah. I am not ashamed to admit that I like this, even though it gets a little unbelievable. I mean, sure, it’s a movie about little balls of dust fighting for their lives against an evil maid, but that’s the easy-to-buy part. It’s when the maid gets sucked into the vaccuum that you go right along with it. When I suspend disbelief rather than pick it apart, that means I’m attached. And on that note, happy Saturday.